May 11, 2011 | katie m.
Summer is here. And I have once again confirmed that I am one of those people who does not deal well with changes to routine. I’m cranky like a fussy baby with a dissertation to write. Also, it’s hot here. Let’s just say I’m glad to be leaving next week. The trip is nerve-racking — so much to accomplish, so little time! — but someone reminded me yesterday evening that it’s supposed to be exciting! and fantastic! I’m trying to stay with that enthusiasm. Because it will be awesome. And nerve-racking. 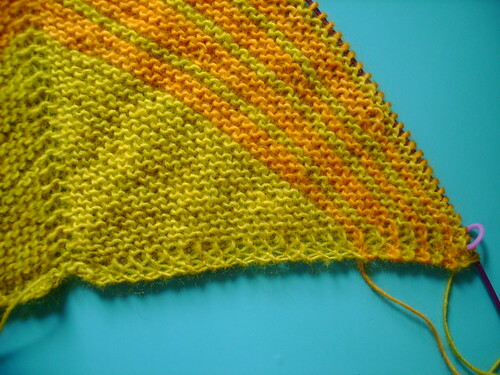 In knitting news, the sunset/ frank ochre stripe study was a bust. It’s just not right somehow — too much orange, too much contrast, too much bright … something is off. As Eileen mentioned, “a lot of look” and that pretty much describes it. Too much look. So I ripped. 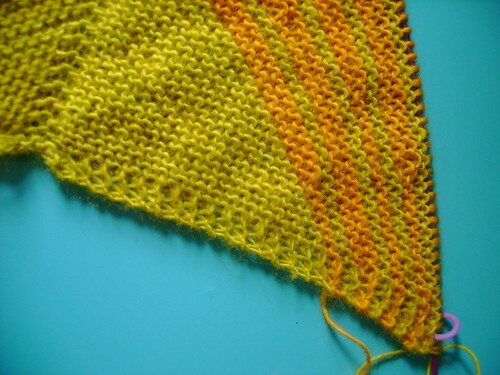 To remedy the problem, I ordered another shade of Malabrigo: sauterne. This is the look I was going for: yellow on yellow. 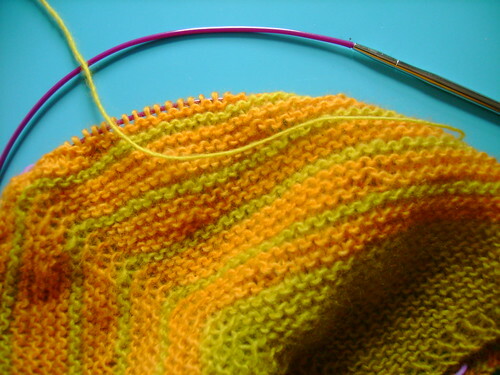 And the pattern really is lovely to knit. So lovely that I bought different lines as well … perfect travel knitting. Without a doubt. If the yarn arrives in time, of course. Here’s hoping the yarn fairy comes quite soon! I love the “Yellow on Yellow” look. Heading across the pond sounds delightful! Wishing you all the best. I truly am a bit jealous — my work just doesn’t require any overseas travel right now, as nice as it would be to get away. ooh, a research trip tp Europe – lovely! (If you happen to pass by Germany I’d be willing to treat you to a coffee 😉 ) The stripes look good, I’ve just ordered a second colour to cast on for Stripe study as well but I’m settling for a vivid dark blue and apple green (just ordered). Also, I have to admit I’m a bit jealous as well – the only research trip I forsee for my PhD will be a journey to Cologne (half an hour by train 😦 ) Have fun!!! There’s summer in the colors 🙂 Love it. May your happy knitting ensure happy research and adventures. I’m slowly returning from hibernation — just as you are heading out! Hope you have a great trip. Boh sends happy thoughts to Alice.